Ever had one of those "I've lost it and my mind has left my body" moments? Okay, well maybe I'm the only one, but Saturday I lost it. After dealing with what can only be described as way too much stupid the last few months I walked downstairs half-asleep, hadn't even turned on the lights yet and stepped in dog pee(I should also mention this has been a recurring theme as of late). I'm not quite sure whom I yelled at more Hot Dog Dude or the one who I knew was really responsible - Rusty. Yes I'm naming names; despite having two children Ted has always been my favorite (there I said it). For years I always had my suspicions about Rusty, he just has the yeah I did it and what the hell are you going to do about it look about him. I can't even tell you how many times I've come home from being out to find bathroom trash strewn from the upstairs to the downstairs. 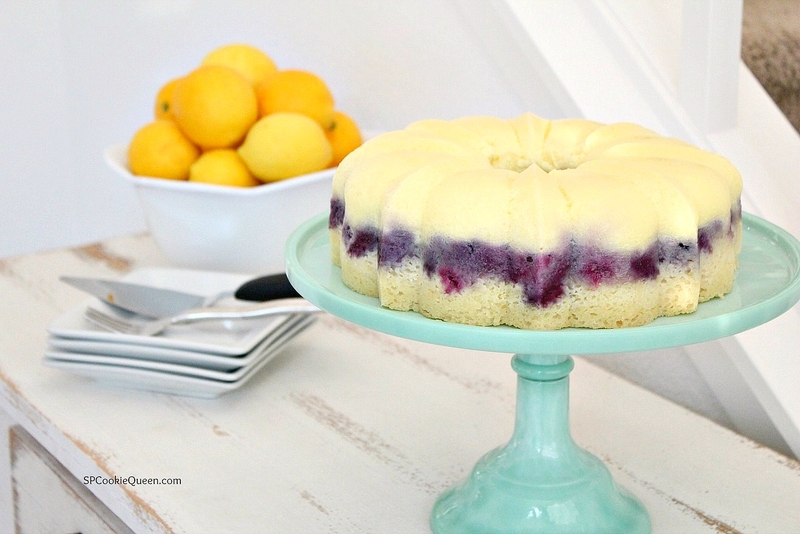 I went to yoga this morning and said, "Namaste" and everything which I think means bye-bye to all the drama you dealt with before you got here, but I'm still feeling a little on edge, so let's go to a happy place and talk about this light, luscious, lemon-blueberry-flan cake. I have it on good authority that you can serve this cake to someone and it pretty much negates anything that happened previously. Yep, slate wiped clean. 1. Rub a 12-cup capacity bundt pan with softened butter and spray with non-stick spray for good measure. 2. Move the oven rack to the lower 2/3-rds and preheat to 350 degrees F.
3. Put on a couple cups of water on in a tea kettle to boil. 4. Whip the 4 egg whites in the bowl of a mixer or by hand until soft peaks form. Set aside. 5. In another large bowl add vegetable oil, butter, flour, baking powder, baking soda, salt, lemon zest, lemon juice, granulated sugar, buttermilk and mix until combined. Fold in egg whites and then fold in blueberries until well combined. Pour cake into the bottom of the bundt pan. 6. In a small saucepan combine milk, sugar, lemon zest, and lemon juice and heat on medium until hot. 7. Ladle a little bit of the milk into the egg yolks, whisking and then adding a little more milk, then add the eggs back into the saucepan and heat for one more minute. 8. Strain the custard with a fine sieve to remove the curdled bits that will have formed from the lemon, and slowly pour the custard over the cake batter already in the pan. 9. Place the bundt pan in a large roasting pan and pour a couple inches of boiling water in, place carefully in the oven. 10. Bake 60-70 minutes uncovered, until a toothpick inserted comes out from the cake clean. 11. Remove cake from roasting pan and let cool on the counter for 45 minutes and then place in the fridge to cool for another 15-20 minutes. 12. Invert the cake onto a serving platter and keep in the fridge until really cold and ready to serve. If this cake doesn't get you out of the doghouse, what exactly did you do, and can you share with the whole class please. I can use a little levity around here. Masterpiece indeed! Anything lemon blueberry is my happy place too :). 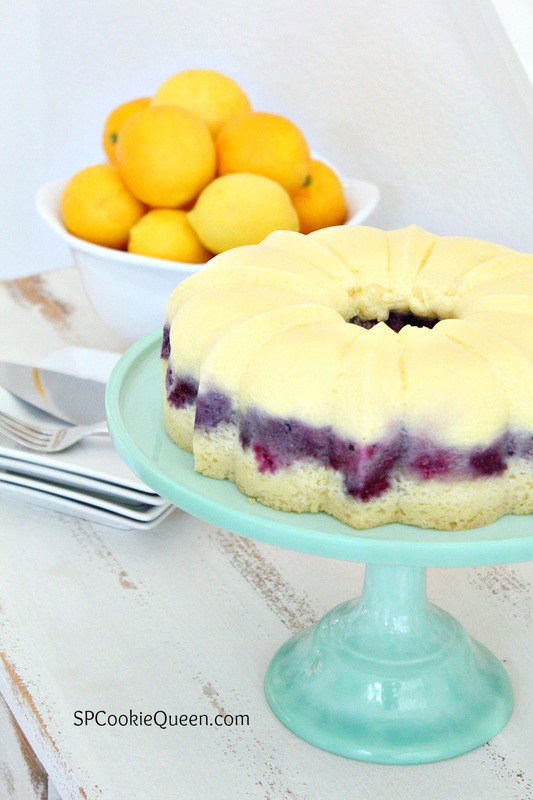 What an extraordinary bundt cake! I totally love that lemon flan, Gina.